Recruitment and training at Starbucks Induction training is a process where a business teaches its new employees how the business works. One benefit of this is that it is a good way to provide the new staff with the general information of the business, such as health & safety, security, personnel and the departmental systems. This improves the employees' understanding of the business, which can increase motivation in the business. Another benefit is that the new employees can contribute to the business more quickly, as they would already know how the business works, and what their role is in the business. 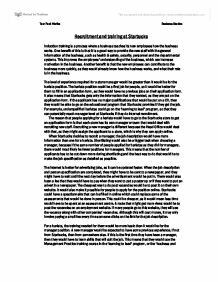 The level of experience required for a store manager would be greater than it would be for the barista position. The barista position could be a first job for people, so it would be better for them to fill in an application form, as they would have no previous jobs on their application form. 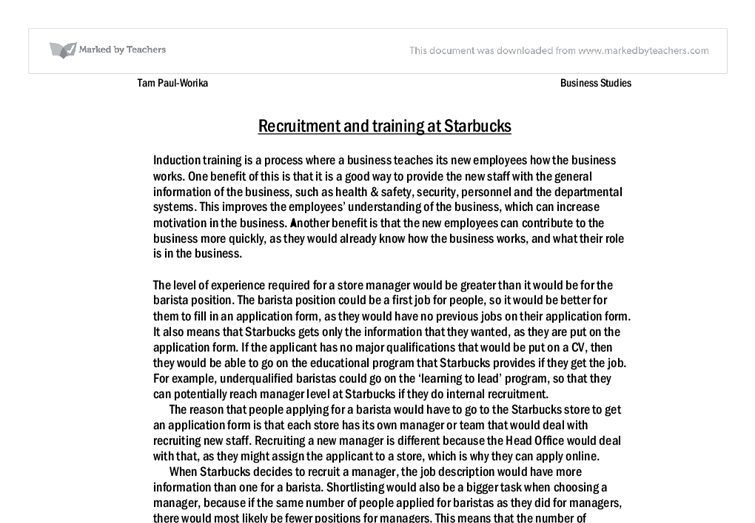 It also means that Starbucks gets only the information that they wanted, as they are put on the application form. ...read more. This means that the number of applicants has to be cut down more during shortlisting and the best way to do that would be to make the job specification as detailed as possible. The Internet is better for advertising jobs, as it can be updated faster. When the job description and person specification are completed, they might have to be sent to a newspaper, and they might have to wait until the next day before the advertisement would be put in. There would also been a fee that they would have to pay when they want to put a poster up or if they want to put an advert in a newspaper. The cheapest way to do post vacancies would be to post it on their own website. It would also make it possible for people to apply for the position online. Starbucks could have a questionnaire that can be filled in online which could replace some of the assessments that would be done in person. ...read more. It also gives them a first hand experience of how the business works. Unfortunately, if the trainer has any bad habits in the business or takes any shortcuts, they could be passed onto the new staff he is training. If a barista does not have many qualifications, or does not have many business skills, then they can also go on some of the courses offered by the SSC, such as the computer skills course or the conflict resolution course if they hope to become a manager at some point in the future. If there are people who work in Starbucks who have a major interest in coffee, they might go on the 'coffee education' course, so that they can find out more about coffee. This would be useful for managers, as it means that they will understand their project better. In addition, if a customer wanted to know more about the coffee they are using, they would be able to ask the staff and get some information from them. ?? ?? ?? ?? Tam Paul-Worika Business Studies ...read more. that people have a wider selection of channels so this increases the amount of programmes people have available to watch. Also so many more people in the UK own a television than ever before, this could be because it has become so cheap for people to pick up a television. This methodology will make use of only the secondary research in order to review the case studies based on the past destinations which hosted the Olympics. The quantitative as well as the qualitative research methods are been used in order to complete the research process. * The health and safety act. * Trading restrictions. 2.2.6 Environment: * Minimising the use of resources by reducing carbon foot print. * Bad weather conditions * Planning permission. * Environment friendly products. * Planning permission. 2.3 influence matrix Environmental Influence on industry (A) Influence on business (B) A x B Justification Minimising the use of resources by reducing carbon foot print. for the management of a significant number of central London estates on behalf of high profile estate clients, charities, property companies and private individuals. * Mixed use. Cluttons has been advising clients on commercial and residential mixed use properties for over two hundred years. Availability of skilled labour The availability of skilled people who can do all sorts of different jobs is an important factor. If there is not a lot of skilled labour around S Parton will find it difficult to find someone to do a job which he cannot do. unnecessary information, it would have took longer to create, and also it would have been much longer, therefore it could have decreased the amount of applicants we received. Our person specification also determines the type of person required for the job, this again saved unnecessary applicants from applying to the job. Visual merchandising and Staff Training. Race Track 1. The major customer aisle begins at the entrance, loops through the store and returns customer to the front of the store 2. Used in departmental stores such as-: Shopper?s Stop, Ritu Wear. Elements of Design Visual merchandising's main purpose is to attract and engage customers to sell products.